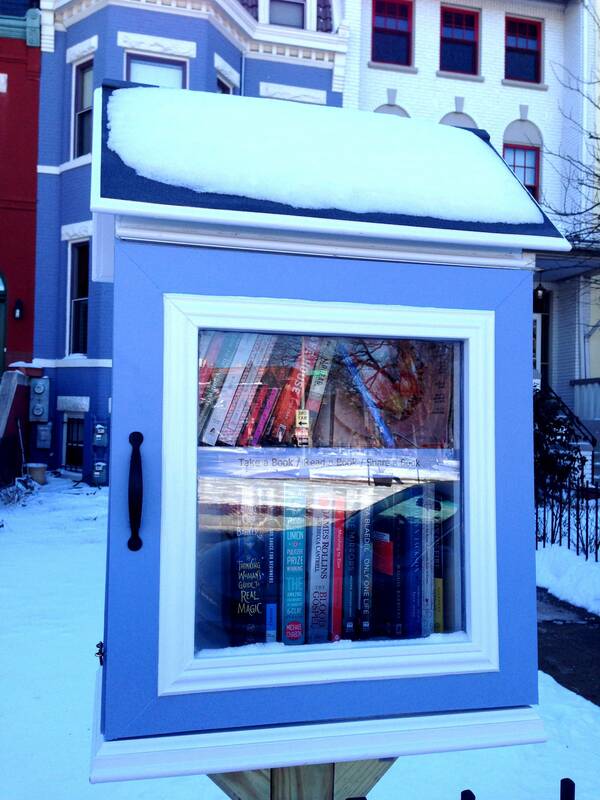 When we bought a house in late 2012 in the urban neighborhood of Capitol Hill, DC, those little boxes of book love called Little Free Libraries were just starting to make the news. Of course I’d heard of them, and considering we live on a busy street with lots of foot traffic across the street from a huge park, I longed to put one in our front yard. Capitol Hill is a literary neighborhood, and I was sure all my neighbors would partake (plus it’d give me something to do with my overabundance of books). Fast forward a year to January 2014. My husband’s parents arrived for a post-Christmas visit…with a little surprise in tow. My mother-in-law heard me mentioning my desire for a Little Free Library over Thanksgiving, and what did they do? THEY BUILT ME ONE. FROM SCRATCH. Using wood and tools and screws and all sorts of things. And then, just to be awesome (and with my husband’s guidance), they painted it to match my house. Possibly the most fun part of having this double-shelved piece of awesomess was watching people discover it. (Yes, I’ve been spying on all of you. We have big bay windows in front of our house, so yes, I sit on my couch with my books and spy.) People would cut across the street from the park, then see this structure in front of the house. So many people actually turned around, going out of their way to explore. I let our local listserv know about it, and I got so many emails from my neighbors thanking me, telling me it fit in so well with the character of our neighborhood. Those first couple of weeks were a whirlwind. Over the course of six days, I had 22 books checked out. TWENTY-TWO. IN SIX DAYS. So of course, I started to really panic. How was I going to keep things full? But then something happened. Something awesome that completely reinforces how much I love my neighborhood. Books started showing up. Not returned, but new books started appearing (or at least, new-to-the-library). And I’m not talking about old, yellowed textbooks or well-worn mass market paperbacks (though, yes, there have been quite a few of those). I’m talking Dave Eggers, Barbara Kingsolver, Alexander McCall Smith, Haruki Murakami, Cassandra Clare, and Kathryn Stockett, just to name a few. More and more books arrive every day; it’s gotten to the point where my neighbors have taken it upon themselves to fill up the library as it gets emptied (or more likely, they, too, are delighted with this new outlet for them to get rid of their old books, but I prefer the more noble interpretation). I still curate (most of those old yellowed books don’t survive my cullings), switching out books and adding more as necessary, but the thing has taken on a life of its own to be sure. Putting in the Little Free Library (or really, watching my father-in-law and husband dig into the semi-frozen ground on a 20-degree day in January from the comfort of the warm house) was one of the best things I’ve done since moving to my new house. Every day, it’s a delight to go out and see what’s shown up and what’s been taken, to make deductions and suppositions on my neighbors’ reading tastes based on what disappears immediately and what lingers. It’s been cold, gross, and snowy outside pretty much since the library was installed. Yet there were 75 books taken between 2/1 and 2/20. Days when the weather has been bearable have meant a significant uptick in traffic. What happens when it gets warm?? Want to build a Little Free Library in your neighborhood? Here’s how to get started.